From high drama to romance, experience the snow-capped Swiss Alps, castles and vineyards of Rhineland on a luxurious 12 day journey from Munich to Zurich. Start your journey with a stay in Germany’s Bavaria, visiting the fairytale Neuschwanstein Castle, before journeying through the dramatic snow-capped Swiss Alps. You’ll enjoy the best of all terrains in this comprehensive itinerary, showcasing some of the rich natural diversity of Europe. With coach journeys through mountainous Switzerland and Austria, and a trip on the region’s worldfamous Glacier Express, there is as much variety in your mode of travel as there are highlights on your itinerary. Arrive in Munich and transfer to your centrally located hotel, where you’ll enjoy a two night stay. This evening, meet your fellow travellers and Tour Director over a welcome drink to celebrate the start of a wonderful journey. Visit BMW World and Museum, which showcases a wide collection of cars (not available all departures, will be replaced with Transportation Museum), or discover the haunting history of the Dachau Concentration Camp through a guided tour. Visit the majestic spires of Neuschwanstein Castle and discover some of its fascinating back-story before continuing to Salzburg for an overnight stay. Enjoy a walking tour seeing locations used during the filming of ‘The Sound of Music’, as well as Mozart’s birthplace and residence. Continue to Innsbruck for an overnight stay. Enjoy a tour of its highlights before ascending the Bergisel Ski Jump tower for breathtaking views over the city. Immerse yourself in the spectacular alpine scenery of Seefeld as you enjoy a horse-drawn carriage ride. Afterwards, savour delicious apple strudel, an eternal Austrian favourite. Depart for Switzerland and upon arrival in the capital, Bern, check into your hotel where you’ll enjoy a two night stay. Journey to Lucerne and enjoy a walking tour of the Old Town, including the Chapel Bridge, followed by a picturesque cruise across Lucerne’s lake to the village of Vitznau. Here, you’ll join the oldest cogwheel train in Switzerland for a breathtaking ascent of Mount Rigi. Enjoy conversation and cheese tasting with wine or home-made apple juice on your visit to a rural Swiss farm. This afternoon, arrive in the mountain resort town of St. Moritz where you’ll be treated to spectacular vistas from your hotel. Board the Glacier Express for an unforgettable ride through the Swiss Alps. Travel through breathtaking mountain terrain towards the alpine village of Andermatt. From here continue to Zermatt, where you’ll get to immerse yourself in the traditional atmosphere during your two night stay. Ascend the Swiss Alps on board the most spectacular scenic rail journey to Switzerland’s highest open-air rail station, Gornergrat, for magnificent views of the Gornergrat Ridge, including the Matterhorn. Alternatively, embrace the alpine way of life on a guided hike through majestic mountain scenery. Board a cog-wheel train to the village of Täsch, then continue your coach journey towards Montreux, your base for your overnight Special Stay. Upon arrival, cruise on Lake Geneva to Chillon Castle, an architectural jewel in the most beautiful setting, and enjoy an included tour. Travel to Vevey, where milk chocolate was created, and Charlie Chaplin settled after fleeing the United States. Following your orientation tour, enjoy some free time. 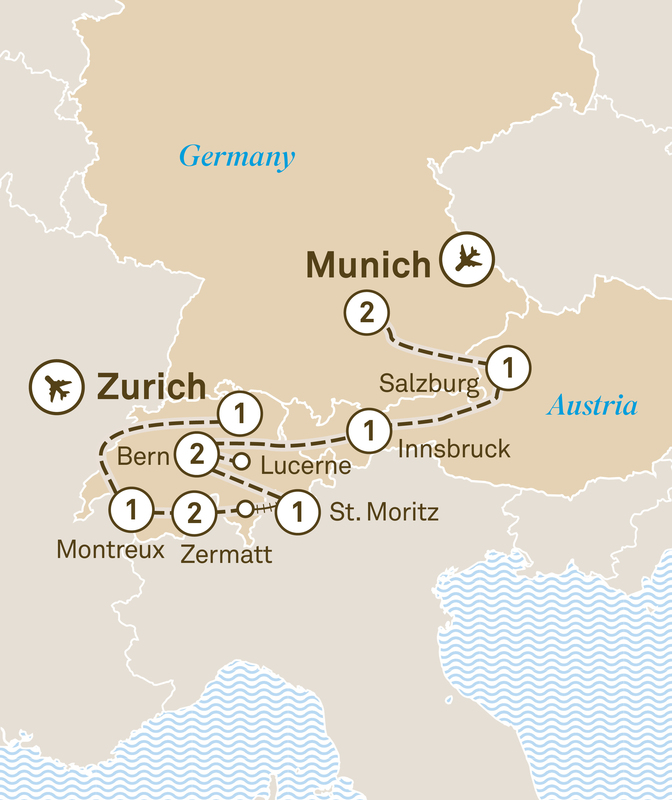 Later, travel to Zurich, the country’s largest city, where you’ll view the Bahnhofstrasse and Romanesque Cathedral, among other fascinating highlights. Later, check into your luxurious hotel for an overnight stay. Depart your journey today after breakfast. Marvel at the endless beauty of the Swiss Alps to Rhineland on a 26 day tour from Munich to Amsterdam. Cruise the Rhine & Moselle in a luxurious Space-Ship.